... hiding. Stella was also known as "The Blond Poison", she had numerous lovers and led a scandalous love life. Her beauty, however, was both a blessing and a curse. How far would I go to save myself and my family? How implacably traitorous would I become in order to survive? These are questions that come into my mind when I think about Stella Goldschlag. A carefree 20-year-old from West Berlin, with golden locks, a cheeky smile and aspirations of becoming a Jazz singer, whose life became about survival and betrayal just because she was a Jew in Nazi Germany. I guide curious tourists through the Scheunenviertel ("Barn Quarter"). Before the war it used to be a rundown neighbourhood where many poor Orthodox Jews from Eastern Europe settled when they fled the pogroms at the beginning of the 20th century. Today, gentrified, swamped with tourists, chic boutiques and trendy cafes, there´s hardly anything left from the Jewish life before the war, accept for memorials and stories of the past that as a guide I try to bring alive. Walking from Rosenstraße to the Hackesche Höfe, we stop on Burgstraße, in front of a modern brick building which houses the "DGB" (Deutscher Gewerkschafts Bund, Federation of German Trade Unions) . Before the war, the department for Jewish affairs of the Gestapo´s Berlin regional head quarters used to be here. I pull out my folder and show the tourists a photo of the beautiful Stella, born as Stella Goldschlag, she later married her high-school sweetheart and became Stella Kübler and then Stella Isaaksohn. I just call her Stella. From all the stories I tell on the tour, I find Stella´s the most dramatic and compelling. Stella was used by the Gestapo to catch Jews who were trying to escape deportation by hiding. 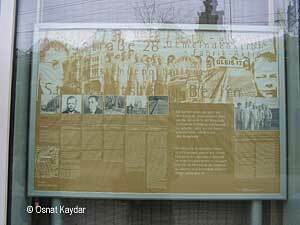 There were about eighteen other Jews in Berlin who were working as "Greifer", "Catchers" or "Snatchers". Stella´s beauty and ruthlessness made her the most famous of them and earned her the dubious nickname "the Blond Poison". Stella was born in West Berlin. She was an only child, pampered with beautiful dresses, adored and somewhat smothered by her loving parents, especially by her father, Gerhard Goldschlag. As a child, in Stella´s eyes, being Jewish was not what defined her. She came from a secular and well-assimilated family. Her father was a World War I veteran. The first time Stella realized she was different, was after the Nuremberg laws, when she got kicked out of school. Instead she had to attend a private Jewish school. 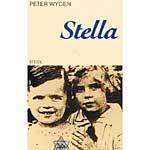 Peter Wyden, a schoolmate from the Jewish school, who had a hopeless crush on Stella, later wrote a book about her life ("Stella: One Woman´s True Tale of Evil, Betrayal, and Survival in Hitler´s Germany"). In his book he describes Stella as the school´s Marilyn Monroe. She was the sexual fantasy of the boys, who lusted after her but never stood a chance. The girls admired her and envied her at the same time. Stella´s dream was to become a jazz singer. She played in a band with her boyfriend Manfred Kübler, who later became her first husband. His family didn´t particularly like or trust Stella – they thought she was just after their money. During the 1930´s, Stella´s father desperately tried to find a way for the family to emigrate from Germany, but it was becoming more and more difficult to escape Nazi Germany, especially since he had lost his job as a journalist and the family could barely make ends meet. Immigrating without having financial abilities was nearly an impossible task. Stella did have a chance to escape on her own to Britain through a school trip that the headmistress of the Jewish school organized, but her father refused she go alone. They would emigrate together or not at all. After the war started, Stella, her husband and her parents, like many other Jews in Berlin were turned into forced labour by the Nazis, working long hours in factories around the city, which was still a better option than being deported to Ghettos and concentration camps. On the 27th of February 1943, the "Fabrik Aktion" (Action of the factories) took place and Berlin was to become "judenrein", "clean of Jews". For a week, the SS raided the factories in Berlin where Jews were working. Stella and her mother Toni managed to escape the raid by hiding in the factory basement, under a large cardboard box. Later, they slipped out of the factory unnoticed. The guard at the gate didn´t stop them. Blinded by Nazi stigmas, he didn´t think a Jew could be blond. Stella was saved by her "Aryan" appearance. Stella´s father had been assigned to the night shift that day so he wasn´t present when the SS showed up at the factory. Stella and her parents had managed to avoid deportation for the time being. Stella´s husband, who was working at a different site, was less fortunate, he was caught, deported to Auschwitz and murdered shortly after. One of the key ways to survive in hiding, besides having food and shelter, was to have forged identification documents. With a bit of luck and contacts, Stella managed to obtain some of the documents she and her parents needed. Through a mutual acquaintance who worked at a delicatessen restaurant, Stella managed to set up a meeting with Rolf Isaaksohn, a document forger. Rolf taught himself the skills of the trade and charged high fees for his documents. He was in his early twenties, devilishly handsome with a dark complexion, oozing with charm and charisma, but beneath his polished appearance he was viciously sly . He had the presence of a movie star and alongside his forging career, he also worked as an extra at the Staatsoper. Stella and Rolf met while queuing in the line of the delicatessen and the two hit it off instantly. Rolf supplied Stella and her parents with the missing documents. It´s scary how being at the wrong place and the wrong time can lead to events that can destroy your life forever. Well, this is exactly what happened to Stella. A few weeks after Stella and Rolf met, they were at their favorite hang-out – Café Bollenmüller near Friedrichstraße, when Inge Lustig, an acquaintance of Stella, suddenly walked into the café. Stella tried to start up a friendly chat with her, but Lustig was nervous and kept a distance. A few minutes later the Gestapo came in and took Stella and Rolf to Burgstrasse. The Gestapo transported Jews in furniture trucks to hide their crimes. Ironically "Move Out – Move In With Silberstein" was the cheerful slogan written on the side of them. When Stella saw Lustig standing next to the truck, she knew instantly that she had been betrayed. Stella started off as a victim of the same crimes she herself would soon perpetrate. 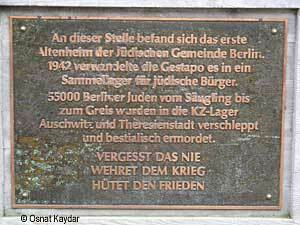 Stella was tortured by the Gestapo and then transferred to a women´s prison, near Tempelhof airport. On the 10th of July, which was her 21st Birthday, she was permitted to have dental treatment. The police dental ward was under-guarded and Stella took her chances and escaped. She went looking for her parents, who were hiding at a friends´ house. It was too risky for the friends to hide all three of the Goldschlags, so they checked into a boarding house which was considered safe. Little did they know that the Gestapo had the place under surveillance. The same night the Goldschlags were arrested. Stella´s parents were taken to the Jewish old age home on Grosse-Hamburger-Strasse which had been turned into assembly camp before deportation. Stella was returned to prison. A few weeks later the prison was bombed in one of the Allies air raids on Berlin. Stella managed to escape the burning building. Yet instead of pursuing her freedom she walked across town, injured from the air raid, and gave herself up at the assembly camp on Grosse-Hamburger-Strasse so she could reunite with her parents. She had made a conscious decision to share her parent´s destiny. Beware of Mr and Mrs Iskü! Stella caught the attention of the commander of the Große Hamburger-Straße assembly camp. He immediately recognized her potential: not only was she beautiful, sophisticated, charismatic and had a zest for survival (having managed to escape the Gestapo twice), but also her experience as a runaway meant she knew what the survival tactics of thousands of other Jews in hiding, were. Also, her love and devotion to her parents were the perfect tools to manipulate her. Stella managed to negotiate exemption from the next transport for her and her parents in return for her help. She received a list of Jews in Berlin that the commander wanted her to track down. She was also expected to initiate her own leads. If she didn´t deliver, there was always the threat of deportation. Rolf was brought to Große Hamburger Straße assembly camp in October 1943 and voluntarily offered to work as an informer. His talent as a forger made him valuable to the Gestapo. Stella and Rolf worked as a team, roaming the streets of Berlin together, looking for familiar faces, former colleagues and school friends or people who looked as if they could be Jewish. They hung out at public places, cafés, next to the Swiss and American embassies, opera houses and cinemas. Stella and Rolf became well known to the Jewish underground, who nicknamed them "Mr and Mrs Iskü" Photos of them were circulated, yet not all victims who ran into them and recognized them were quick enough to escape from them. They became too well known to continue to operate together and had to start going on missions separately or with other Catchers. They had various methods to catch Jews: Stella would show up at funerals of Jews who were mourning Aryan partners, and who were therefore no longer protected by law. She operated mainly around West Berlin. Sometimes, when she suspected people to be Jewish, she would offer them help with food and shelter. If they accepted her offer, she would set up a meeting and bring the Gestapo along. Another game she played was ´damsel in distress´, pretending to be a hunted Jew. She would ask for help from old acquaintances, and when they swallowed the bait she would lead the Gestapo right to them. There were also privileges that came along with this job, such as not having to wear the yellow badge, receiving money from the Gestapo and most importantly: exemption from deportation. Stella managed to remove her parents from the deportation list again and again. But in February 1944, her parents were deported to Theresienstadt, and from there to Auschwitz where they were murdered. Stella wanted to join her parents, but they insisted that she should stay and save herself. That´s exactly what she did. It is difficult to say how many Jews she actually caught, the figures vary, but it is estimated that she and Rolf caught hundreds of Jews together. At this point I close my folder and send the tourists for a coffee break. "But what happened to Stella?" People start asking curiously, "Did she survive the war?" "I promise to tell you what happened at another point of our tour". Sometimes they really insist that I continue, but I like to leave them in suspense and half jokingly say: "If I tell you the whole story now, how will I be sure you´ll return for the second half of the tour?" Later, we continue through the tour and every now and again someone will come by and remind me politely "You haven´t forgotten to tell us about Stella, have you?" When we reach the memorial sight of the old age home at Große Hamburger Straße, I finally continue from where I left off: "After Stella´s parents were deported she became depressed. Also, her affair with Rolf turned sour when she all of a sudden discovered his homosexual tendencies". Then someone in the group makes a smug joke, "What took her so long?" Despite feeling hurt and betrayed by Rolf, Stella had her own affairs: one with Heino Meissl, a detainee at Große Hamburger Straße, whose racial status was questioned by the Gestapo. Heino was 35, a charming and artistic type. Love was not the reason for their relationship. For Heino, Stella was life. She managed to keep striking him off the transport lists. And Stella needed Heino as a character witness. Stella was no fool. It was clear that the war would come to an end soon, and although she had managed to survive deportation and death by the Nazis, she would soon have to account for her collaboration. She was hoping Heino would come in handy. As the Soviets came closer to Berlin, Rolf attempted to escape to Denmark on his own. After the war, he was on the wanted list by the soviets, but they never managed to cover his tracks. He was declared dead. Stella was now pregnant, most likely from Heino. He helped her escape and arranged for her to stay in Liebenwalde, a small town outside of Berlin, where she gave birth to a baby girl. Stella named her daughter Yvonne Meissl. Heino Meissl wanted nothing to do with Stella after the war. Life under the Soviets was harsh. One day, Stella complained to an acquaintance that the Soviet Secret Police were worse than the Gestapo. The acquaintance reported Stella to the local police. Stella ended up once again getting a taste of her own medicine. She pleaded innocent, claiming that she was Jewish and therefore also a victim. The police took her to the Jewish community in Berlin, to see if anyone could identify her. Stella was remembered alright. An official had to prevent Stella from being beaten up but did allow her hair to be forcefully cut off. She stood before a military tribunal and was sentenced to ten years. She served two years of her sentence in Sachsenhausen, a former concentration camp. After she was released in 1956, Stella decided to go to West Berlin to try to locate her daughter, Yvonne, who was being raised by a Jewish foster family. Yvonne was the only hope left in Stella´s life. However, when she arrived in West Berlin, things didn´t go according to plan. In less than a year she found herself on trial which received a lot of media attention. This time there were witnesses at the trial. She denied she knew any of them. Despite being ill with tuberculosis, most of the time she kept her demeanor, showing up to court elegantly dressed, adorned with a pair of white gloves. She claimed to be hated and persecuted by the Jewish community because of her beauty. The trial ended with no further punishment. She couldn´t be charged again for the same crimes, the sentences for which she had already served. Stella didn´t receive custody of Yvonne. However, she was granted permission from the court to meet regularly with her daughter. By then, Stella was married for the fourth time. Yvonne, who had heard stories about her mother from her foster family, wanted nothing to do with Stella. When Yvonne went to visit her mother, she would more or less ignore her. Later on, Yvonne was trained as a nurse and immigrated to Israel. Stella ended up as a lonely and depressed old woman. She only very partly took responsibility for her crimes and continued to see herself more as a victim then a perpetrator. In 1994, she committed suicide by jumping out of the window of her flat in Freiburg. When I finish telling Stella´s story, I get different reactions: "She should have gotten the death penalty", "What a witch", "You can see on her face that she´s pure evil". Others sympathize with her: "She was just a 20-year-old girl, I don´t know what I would have done in her place", "If she wouldn´t be useful to the Gestapo and catch so many Jews, wouldn´t they just deport her?" Once a psychologist on my tour explained to me that the fact that Stella started identifying with her abusers was a sort of psychological defense mechanism. The story of Stella often creates a debate on my tour. Could any person have acted like this under certain circumstances, or was she pure evil or a psychopath? As I say goodbye to the group, and wish them a pleasant stay in Berlin, I know that Stella´s story is the one story they will long remember from this tour. Shlomit Lasky, Journalist and screenwriter. Shlomit has been writing regularly for Israeli media since 2005. She trained as a stage actress in Israel. While living in London (2001-2005) she earned a Masters degree in screenwriting at University of the Arts London. She has been living in Berlin since 2010. Recently she has received a grant from the FFA to write a feature script. She spends her time between writing and guiding for "Gablinger Tours". Maayan Meir, animation producer and project manager. Maayan has produced several large scale animation projects. In 1999 she became an establishing member of the "Keset Hebrew Poetry Society". Her poems were published in several Israeli poetry magazines. A short script she wrote earned an honorary mention by "The Micky Albin Fund" in 2003. She also managed the Film Competition and established the Scripts Competition at the Tel Aviv Students Film Festival. "Erzwungener Verrat. Jüdische Greifer im Dienst der Gestapo 1943-1945" by Doris Tausendfreund, published by Metropol 2006.